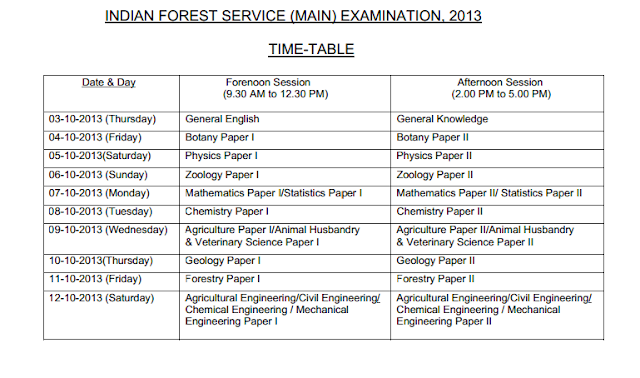 Union Public Service Commission (UPSC) Indian Forest Service Mains Examination schedule has been published my UPSC. We the Examsavvy here by to present you the subsist update regarding the IFS Mains Examination Time Table as well. The UPSC IFS Mains Examination is scheduled to begin with 03/10/2013 i.e. Thursday and Completes by 12/10/2013. On these days there are totally 20 Different Question papers will be conducted. The Examination is planned in such a way that 2 Question Papers per Day. The UPSC IFS Mains Examination is schemed to have two sections as well. The Forenoon section consists of a question paper with 3 hours of Time Duration which starts from 9.30 am and ends at 12.30 pm. Consequently the Afternoon Section Consists of Question Paper with the same 3 hours of Time Duration which starts from 2.00 pm and ends at 5.00 pm. Agricultural Engineering/Civil Engineering/Chemical Engineering / Mechanical Engineering Paper 2. For more details please refer the following image as well.